The A2B Route continued along the service road that follows the Coal Slurry Pipeline. 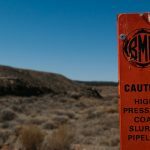 The Peabody Energy Coal Slurry Pipeline originates at the Black Mesa coal mine in the four corners part of northeastern Arizona. It uses water from the Navajo Aquifer to transport coal 274 miles to the Mohave Generating Station in Laughlin, Nevada. The slurry process mixes pulverized coal with water and then pushes it through the pipeline. Controversy arose from an unusually generous mineral lease agreement negotiated under questionable circumstances between the Navajo and Hopi Tribes and Peabody Energy, the coal company’s use and degradation of a potable source of water to transport the coal, and the public health and environmental impacts of strip mining on tribal lands. The pipeline was in operation from 1964 to December 31, 2005, the Black Mesa mine’s last day of operation. During its time, the pipeline was the only coal slurry operation in the United States and the only one that used groundwater in such a way. Even before dawn, today’s To Do List was already at critical mass. So, I woke up extra early to get my run in. One look at the weather eliminated any hopes of beating the heat. It was already very hot and humid. I considered driving out to place frozen water bottles on the running route. But, there was no time. One large bottle would have to do. To be extra safe and hydrated, I drank one large glass of water before stretching and another one before heading out. Other than the heat and humidity, the run was uneventful. It was nicely quiet and without traffic distraction. Some days when I run, my thoughts are random. Other times, life provides me with an opportunity to ponder, process and attempt to solve a problem or two. Most often, I use the time to focus more intensely on something that is already heavily on my mind. And then there are days like today when my thoughts are deliberate and meaningful. Today’s run is commemorative and celebratory. You see, today is my Mother’s birthday! How lucky am I to have someone so wonderful to consider on my July 15 run!! As I ran, I thought about the things that I love most about her. For example, Mama has a beautiful alto voice. I grew up hearing her sing at church, in the car, in the kitchen, and a thousand other places. Because of her, I have never known of life without rich harmony. I have always loved how Mama never misses a chance to laugh. One morning before church, I discovered where she had hidden the chocolate chips! I grabbed a couple of handfuls and stuffed them in my pockets to secretly enjoy during church. (I was seven or eight at that time.) Later, sitting in the chapel with my family and in the middle of the entire congregation, I was surprised and mortified to reach in my pocket only to retrieve a handful of chocolatey goo! I remember thinking that my mom was going to kill me because I had broken into chips and because my good Sunday pants were now permanently stained with semi-sweet morsels! Instead, she just cracked up!! Even though at the time I was grateful to be saved by laughter, it is the sound of her laughter that sticks with me. On more than one occasion I’ve heard that stern “Daryl Robert O’Bryant” as she tried to teach to always do right. Funny how I look back on a lot of those moments and smile. My mom, along with my dad, taught me about absolute dedication. From her, I learned to treat others with respect, kindness, gratitude, and affection. As I’ve gotten older, I have been amazed to watch her and Daddy just love their children and grandchildren. No matter what the circumstances or news. Like most others, that love has been tried again and again. But still they stand true to their family. They love and believe in us. Once, a few years ago, I remember thinking that no matter how old I get I am still my mother’s son. What a wonderful discovery! I am forever grateful that I will always be Jean O’Bryant’s son. Any thoughts? We’d love to have you share! Love this! Thanks for sharing your memories! Happy Birthday Jean!